Western Front presents a weekend-long screening in the Grand Luxe Hall of Duncan Campbell’s film Bernadette, as part of the Contemporary Art Gallery’s exhibition The Act of Seeing with One’s Own Eyes. 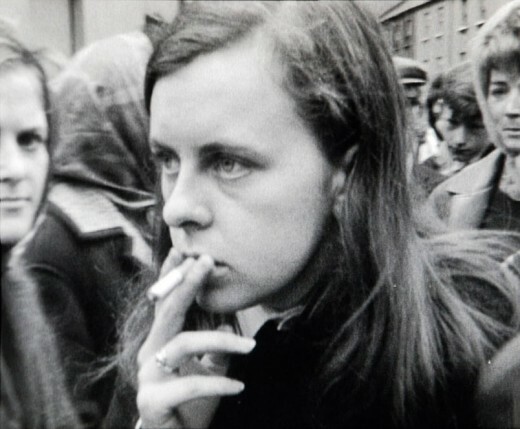 Bernadette presents an open and indirect account of Irish dissident and political activist Bernadette Devlin, constructed out of archival footage from the 1960s and early 1970s. Campbell approaches documentary as form of fiction, revealing the complex relationship between author, subject and audience. Duncan Campbell (born 1972 in Dublin) received a BA from the University of Ulster in 1996 and an MFA from The Glasgow School of Art in 1998. Recent solo exhibitions include the self-titled show at the Carnegie Museum of Art, Pittsburgh in 2012; Arbeit at Hotel, London in 2011; and Make It New John, which was staged in 2009–11 at London’s Chisenhale Gallery, Glasgow’s Tramway, Sligo’s The Model, Belfast Exposed, and New York’s Artists Space. Campbell also participated in the British Art Show 7, which toured venues in Nottingham, London, Glasgow and Plymouth in 2010–11. In 2013 he participated in Scotland + Venice at the 55th Venice Biennale. He has been nominated for the 2014 Turner Prize. He lives and works in Glasgow. Still from Bernadette by Duncan Campbell (2008). Film transferred to video. 38 minutes 10 seconds.